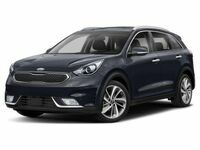 The 2018 Kia Niro is a sporty, intuitive crossover hybrid model. It makes a bold entrance with its wide stance, sleek, dark trim, and available High-Intensity Discharge (HID) projector beam headlights and LED positioning lamps that provide a bright illumination to light up the road ahead. From the wheels to the rear spoiler, the Kia Niro exudes style and athleticism. From top to bottom, each of these elements was made with aerodynamics in mind to minimize drag and improve fuel efficiency. The inside of the Kia Niro is loaded with premium materials and amenities that are available to enhance comfort and convenience for all passengers. Soft leather seating envelops passengers in comfort, while a heated steering wheel adds a level of luxury for the driver. The Niro interior is also spacious, allowing all passengers to stretch out and relax on longer trips. Available heated and ventilated front seats ramp up comfort and an available 10-way power driver's seat with 2-way lumbar support also features an Integrated Memory System that saves mirror and seat settings for up to two drivers. 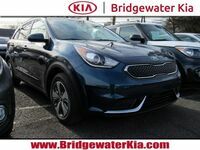 The Kia Niro offers plenty of space for passengers and cargo alike. Every inch of the cabin was designed to use the most space, featuring hidden storage under the rear floor so that you can keep valuables safely hidden away. An available cargo cover also helps you keep your belongings safe, and can be easily removed when you need more room to store larger items. The rear seats of the Niro have a 60/40 split-folding option so that you can create any combination of passenger and cargo space that you need. 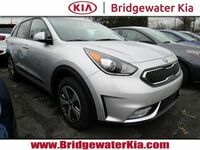 The Kia Niro offers a maximum cargo capacity of 54.5 cubic feet. The hybrid system on the Niro offers the latest and greatest technologies to provide the best possible hybrid experience. At the heart of the Niro is Kia's Full Parallel Hybrid System. This system combines the power of a hybrid-optimized engine with a lightweight, highly-efficient electric motor and lithium-ion polymer battery. These systems work together to provide you with outstanding efficiency and a smooth, responsive ride. The Niro features a 6-speed dual-clutch automatic transmission that allows you to experience smooth, quick shifting and an exhilarating ride. 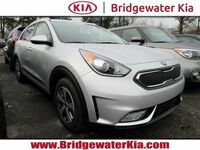 The 2018 Kia Niro is available now at Bridgewater Kia. Browse our inventory and set up a test drive online today!